Washington State isn’t known for regular, fantastic displays of lightning, but on a particular summer night in July of 2012, that changed. One doesn’t expect such storms to break over the Olympic Mountains, but this one did and it seemed to have gotten itself stuck! James and I lingered at the top of Hurricane Ridge to experiment with astrophotography. It was a beautiful night of stars twinkling overhead. It seemed that they were simply waiting for us to capture their light. We weren’t alone on the ridge, as a group of sagely looking astronomers were there as well, armed with a bright red telescope the size of a large cannon, pointed heavenward. James and I had set up some ways away from them, but I meandered into their midst and asked them a few questions about the telescope. I learned that it was made by the group and that they frequently went up on the ridge to implement it. That was exciting! These men reminded me of wizards, some having large beards and a profuse, nearly mystical quantity of knowledge about the heavens above us. They are my favorite kinds of people! It must have been fairly obvious that I was dying to look through the optics. The twinkling of the stars and distant planets seemed to scream ‘look at me!’. I’m not good at ignoring them when the appropriate tools are nearby. I lingered, probably awkwardly, listening in as they chatted, pointed, peeked through the scope. There was discussion regarding the rings of Saturn. I’d previously seen Jupiter and it’s moons (mind boggling in it’s own right) and finally, was invited to look upon this unfamiliar gas giant in real time (well, close to real time!) I stared. I tried to burn the image into my eyes, into my mind. When I was satisfied, I retreated, considering the sight quietly. It wasn’t very long before I noticed they’d gotten a bit quiet…suddenly these astronomers were chattering and I noticed a tremendous wall of clouds sweeping into the sky in the distance, which they eyed concernedly. Minute by minute, the deep blue of the sky was replaced with a brooding mass of whispy tendrils that blocked out and seemed to devour the happy glittering of celestial bodies. It was time to go, the stargazers decided. There really was nothing for them to see, so, they packed and promptly left. James was ever stoic, guarding the cameras in our corner of the parking lot which I soon returned to. It wasn’t looking so great for the theme of the night, there wasn’t much for us to shoot, but we were curious as to the weather – instead of stars, perhaps we could shoot lightning! Tripods stood, lenses pointed out towards the horizon and two eager humans admired the unfolding scene. We soon got MUCH more than we bargained for. The storm rolled in like an ocean wave breaking against the rocks! BOOM! I LOVE lightning. 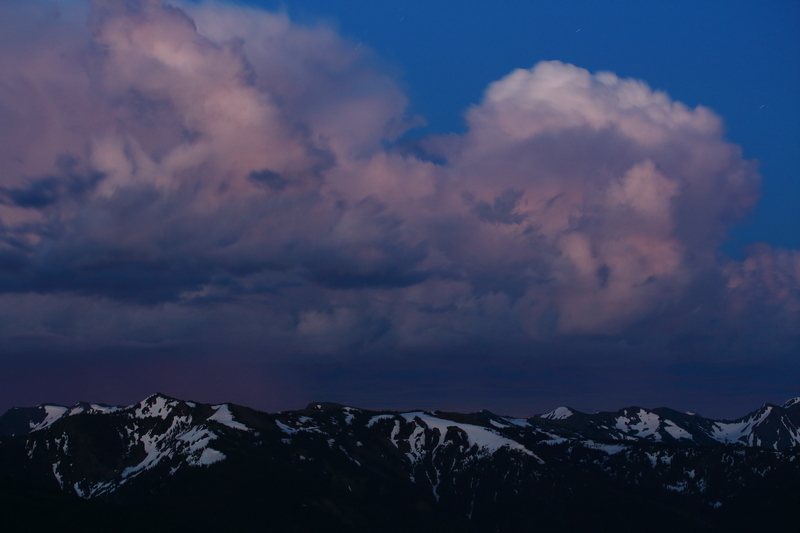 I love watching the clouds grow fat on moisture and heat as the sun dips beyond the peaks of surrounding mountains. Like cauliflower, bright white at the top, boiling high until it reaches its limits and unlike cauliflower, flattens out – the ominous anvil takes shape and declares that soon, sparks and heat will burst out from it. 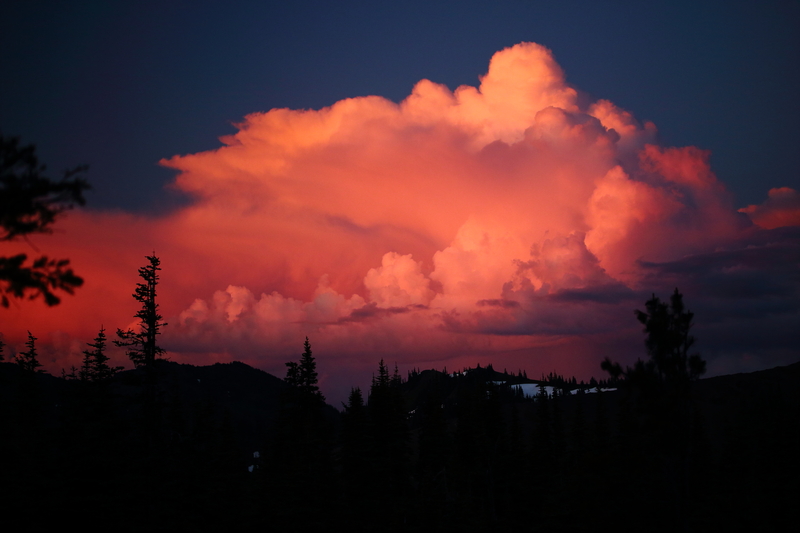 The cloud swells as the sun bathes it in orange and pink hues. I love how that mass, like some great organism, confidently unfurls itself for great distances, hungry and searching. I love how it casts its deep shadow on the earth below. It brings with it a dread coolness, especially on very hot and humid days, while also commanding an eerie and reverent silence. Animals hunker down or flee. There is so much tension in the stillness. It is fantastic to feel that weight and energy. I live for those moments just before the activity really picks up! – the cool downdraft that flows out over the grass, how it gently rustles the leaves on the trees, the way in which it blows through my hair like a determined sigh, how it caresses my skin. I get lost in it. Lightning can seem completely alien, it is a truly monstrous force, but to me it can also seem like an enormous companion. I mean, we each have little storms inside of us, there is electrical activity within our own hearts. Along with volcanoes, these forces of nature are the engines of the earth. Nature gives and takes. It is a god. 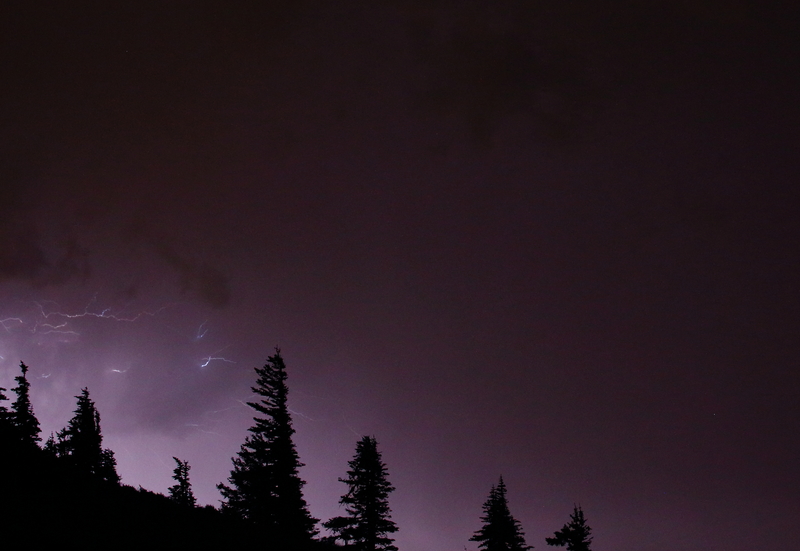 We took a few shots but didn’t have much luck with actually capturing any bolts. After a while it was clear that the core of the storm was directly overhead and it was becoming exceedingly dangerous. It wasn’t often I’d been on a mountain top with lightning. Actually, that had to have been the first time! We had binoculars on us and as bolts shot down into the valley, we watched trees burst into flames. It was pretty wild! We stared in awe as two trees burnt. The valley rang with violent thunder. I could feel the storm pressing down on the land and I felt so incredibly tiny. It was becoming stupid. I called it quits and scrambled into the truck. Flashes of light over the ridge. James is always extremely safety oriented, but this time he stood out there to watch the lightning while I whimpered for him to come in. Normally I’d be right out there, devil-may-care, daring nature to deliver. But not so much these days. Not so much that day. I’ve got so much to live for, and gosh dangit, I love James to bits and didn’t want to see him burst into flames too! I whimpered some more and he eventually caved in. I was happy when he sat beside me and we agreed to get to safety. We left the ridge and went home. I thought for sure the storm would ease up on us, but I was completely wrong! For the rest of the night, bolt after bolt crashed down over the peninsula, flashing and rumbling over the area like an angry tiger. It was so crazy – sparks were leaping from the outlets! It was nearly impossible to sleep, the whole house shook. I felt like an ant in a bowling alley. It was awesome! Hurricane Ridge on the night of the 13th.